There is a growing demand for energy on a global scale and the risk to industrial accidents is increasing. Consequently, the demand for safety systems is growing more and more. User requirements for safety systems have emerged not only from a safety point of view but also from the viewpoint of ease of use in close conjunction with other systems and system functions such as DCSs and operation and monitoring functions. These factors constitute the background to the development of the ProSafe-RS. In the light of the above background, this paper discusses the safety systems market and prospects for the future of safety systems. Environment and safety are major topics on a global scale in recent times. As symbolized by the effectuation of the Kyoto Protocol, an interest in preserving the environment is growing worldwide, and there is also a tendency to criticize more severely, occurrences of industrial accidents that are accompanied by environmental contamination or which may cause damage, etc., to residents in the surrounding areas. In addition, there are increasing risks for industries for which such accidents are a possibility, and an increasing need to ensure safety and prevent industrial accidents from occurring, or, if they do occur, to prevent their impact from spreading externally. This paper describes the market scale and trends of safety systems, which constitute the background of developing our safety system ProSafe-RS, and an expansion in the requirements associated with them. It also explains the future prospects of the ProSafe safety system. There have been growing energy demands around the world due to the economic development resulting from former Eastern European countries joining the EU and the rapid economic growth of 'BRIC,' or Brazil, Russia, India, and China. To respond to these demands, investments in oil and natural gas exploration and production (exploitation and development) have been increasing around the world. Moreover, as a natural consequence, there is also a tendency to raise investments on downstream equipment ranging from transportation, storage, and refining of such oil and natural gas resources, to the petrochemical industry that produces intermediate or end products. In relation to the equipment and facilities associated with oil and gas, particularly, petrochemical complexes, conversion to larger scale operations and bigger areas is proceeding year after year. It can be said that not only is the amount of investment per investment increasing, but also the business risks or the accident risk per investment is on the increase. In other words, the trend is for the demand for safety instrumentation to continue to grow even further in the future because the scale of the market and the risks are increasing. According to ARC, a research firm in the United States, the scale of the safety instrumentation market is US$734 million in 2005, suggesting that growth will continue at an annual rate of 7% or more in the future. If this growth rate is maintained, the safety systems' market scale will reach an amount of 100 billion yen by 2010. In line with these trends, safety system vendors in the process automation market have been supplying various types of products. Safety systems can be classified according to their architecture. 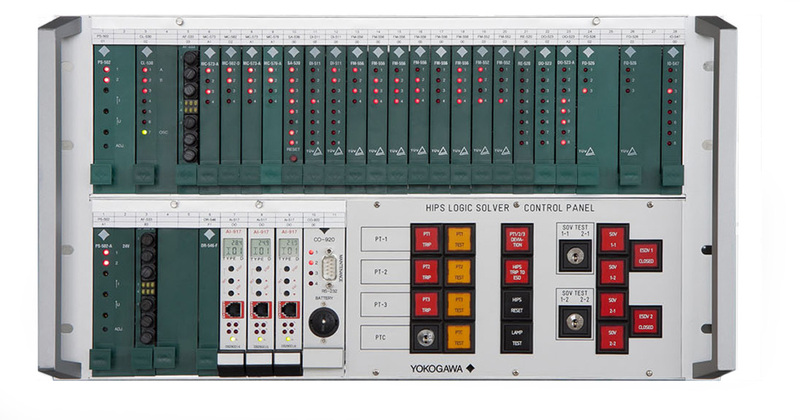 Yokogawa's ProSafe SLS has become synonymous with the solid-state safety systems that were developed in the 1960s and that have a long history. Then, products in the category known as 'programmable safety PLCs' to which processor technology has been applied were developed after 1970s and have been evolving ever since. Currently, this type is synonymous with the mainstream of safety systems. For safety PLCs, SIL3 (safety integrity level 3) has been defined as the highest level in accordance with international functional safety standard, IEC 61508, and each manufacturer provides SIL3 products. These so-called safety PLCs can be classified further by their architecture. The first is a type known as the triple modular redundancy (TMR) which adopted the majority voting technology developed for the aerospace industry in the 1970s. This type was designed at a time before self-diagnostic technology was developed, under the precept that there can be almost no chance of a mistake if the same devices are arranged in row to make determination by majority. Afterward, self- diagnostic technology was developed, and dual-redundant systems were developed for which no triplex form was necessary provided this self-diagnostic mechanism was installed. These systems are generally called "1oo2D" (1 out of 2 diagnosis) systems. At present, the safety PLC market is divided equally between these triplex systems and dual-redundant systems. In recent years, a system called the "quadruple system," or "2oo4," meaning that it is equipped with four processors, has also appeared. However, apart from having four processors, these systems are single or duplexed, and therefore can be classified as derivatives of the dual-redundant systems. Moreover, safety systems have also appeared that have achieved SIL3 in a single configuration by running internal software twice. In addition, some vendors have also released field devices in recent times that have been certified by SIL. Among these products, our EJX has been drawing attention as a transmitter that has been recognized by the TÜV's SIL2/3 as standard. 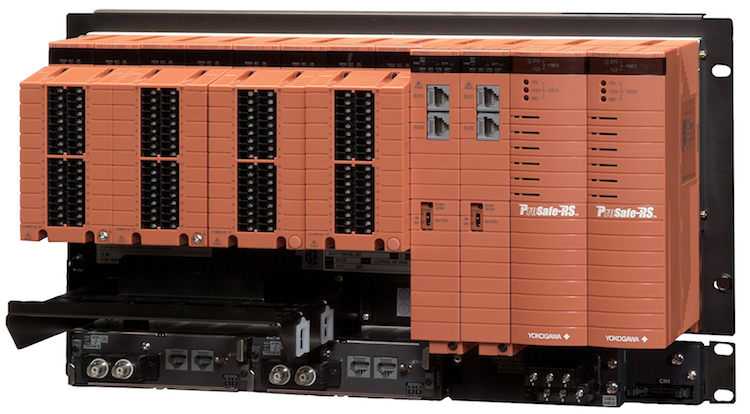 Since its entry into the safety instrumented system (SIS) business in 1997, Yokogawa Electric has been offering SIS solutions with a product lineup of the ProSafe-PLC and solid- state ProSafe-SLS. The ProSafe-PLC can be used for applications up to SIL3 and the ProSafe-SLS is applicable up to SIL4, the highest safety integrity level. Most end users value these products highly, particularly as integral solutions with DCS. Yokogawa's overseas industrial automation (IA) business has been increasingly successful in recent years. In fiscal year 2003, system products such as DCS and safety systems achieved a growth of 20% or more, while products such as differential- pressure flowmeters and temperature transmitters showed a growth of 15% or more. In addition, our overseas IA business occupies a significant position in the oil and gas markets. The world's oil and gas markets range widely from exploitation, transportation, and refining of oil and natural gas to the petrochemical industry. For example, with respect to LNG (liquefied natural gas), for which demand has been growing as a fossil fuel second to oil, Yokogawa maintains the position of the No. 1 vendor. These oil and gas markets are truly the main markets for safety systems. Furthermore, there have recently been a number of cases where orders for instrumentation for large-scale plants have been received. When the details of ordered amounts are observed, DCS and SIS have attained almost the same amounts. In these kinds of projects, questions are being raised about the ability of a single vendor to provide integral solutions rather than individual products such as DCSs and SISs. Yokogawa has been increasingly enhancing its presence as one of few vendors that has not only achieved high product quality but also possesses a system for providing global solutions. In this way, the importance of SIS in our IA business is increasing more and more, and against that backdrop we have received strong demands from users for easier-to-use safety systems. To be more specific, such demands include integration with operation and monitoring DCSs, greater compactness and scalability capable of covering small- to larger-scale applications, configuration to improve plant operability as well as safety, and mechanisms capable of designing, building, and maintaining DCS and safety systems more easily. To respond to these market demands, Yokogawa released the new product ProSafe-RS in February 2005. As introduced in another paper in this Technical Report, the ProSafe-RS is a completely new safety system product having DCS integration as its basic concept. The ProSafe-RS has taken the first step as a system product having integration with the CS 3000 as its primary feature. With the aim of offering the best solution as our business policy, we will further proceed with a functional expansion such as closer integration with the CS 3000, cooperation with safety field devices, support of Fieldbus (such as HART and FOUNDATION Fieldbus), and conformity with PRM (plant resource management). This paper has introduced the current state of our safety systems and their future prospects. In light of the substantial increases in crude oil prices in recent times, and the corporate responsibility to secure social safety and preserve the environment and so on, attention on safety systems is expected to increase more and more. We would be very pleased if our safety systems are of some assistance in improving the safety of society. "Prosafe" and "PRM" are registered trademarks of Yokogawa Electric Corporation.